Snowstorms begone as the lateral market continues to heat up to unprecedented levels in New York. With the first quarter wrapping up in a few days, this is the best Q1 that New York has ever had for lateral moves for associates, partners and total lateral moves. There have been 248 lateral moves so far this first quarter, which eviscerates 2014’s opening tally of 118 lateral moves. DLA Piper and Wilson Elser lead with 9 associate gains each, with the usual suspects of Skadden, Goodwin Procter and Simpson Thacher rounding out the top five. 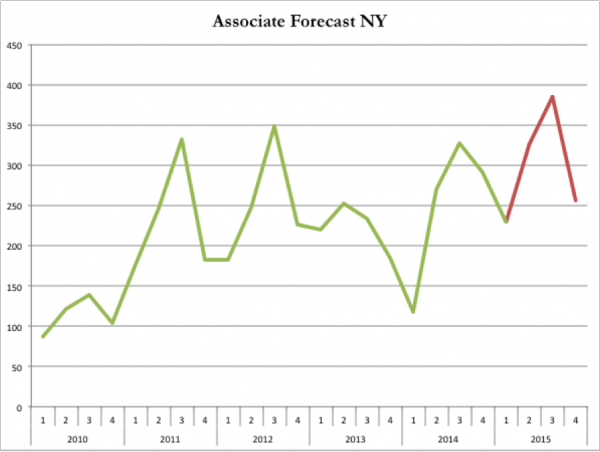 New York has a strong seasonal trend and Q2 and Q3 tend to be the most active seasons for lateral moves. On average, these two quarters together are 45% higher than Q1 and Q4 together. One reason for this is associates tend to stick around to collect their year-end bonus and by the time they collect and initiate a lateral search, it can be the second or third quarter before they actually move. The New York associate market is high on real estate, banking and corporate, while litigation lags behind slightly. Tax positions are also surprisingly abundant, but the IP market remains tepid for associates. 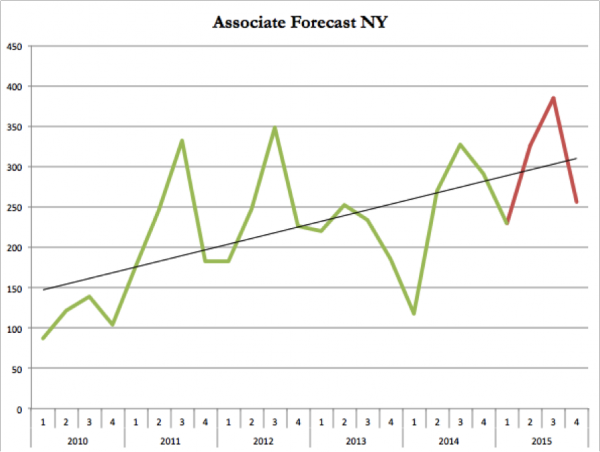 The NY associate market has grown at a staggering pace since the recession. Its projected rate of resurgence beats the other top tier markets by a significant margin. This rate could level off in the near future should more firms reach (or exceed) critical mass, but in the short run, the associate market should continue to grow. While the New York partner market looks more subdued compared to the associate market, this is the case in every city. 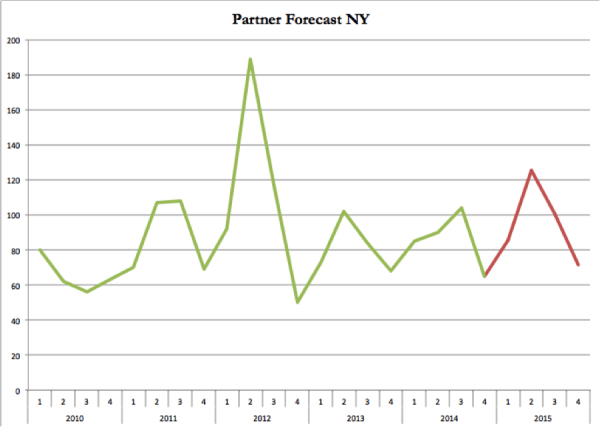 It’s not that the partner market isn’t rebounding, but that partners are more immune to the poxes of a recession. While the market for partners will likely lag behind 2012’s blistering year, it should be the second best post-recession year for partners with around 382 partner moves. Winston & Strawn has started the year strong, collecting nine partners from Pillsbury—the most of any firm—including Pillsbury’s structured finance head Jeffery Stern. Davis Wright Tremaine, DLA Piper and Greenburg Traurig round out the top four in partner gains. 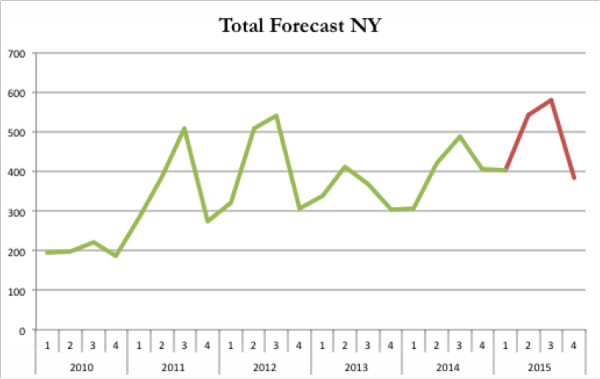 Despite a seemingly lukewarm partner market, the overall New York market is expected realize a 17% increase in lateral activity from 2014 and a 138% increase from 2010. Should the economy hold steady over the next half-decade, we will likely see Biglaw rise to unprecedented levels as firms continue to grow through summer recruiting and mergers. If law school applications do not rise at the same pace, we could likely see more slots open for first year associates who might have otherwise not made it into a Biglaw firm, and more senior associates make partner when they otherwise would have made counsel.